ERIN WALLACE, 36, of Lafayette Hill, owns Devil's Den in South Philadelphia and Old Eagle Tavern in Manayunk. 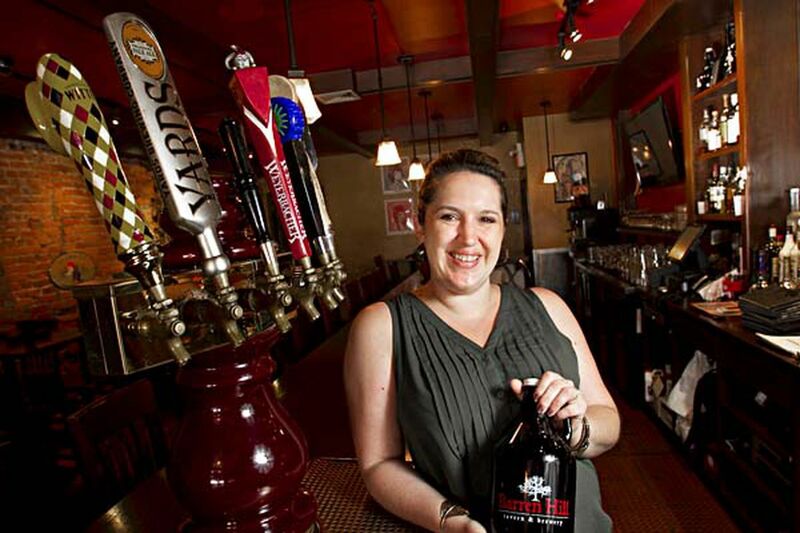 In fall 2013, she opened Barren Hill Tavern & Brewery in the old General Lafayette Inn in Lafayette Hill. Wallace, a native of Baltimore, is one of the few female brewery owners in Philly. Q: How'd you get into the tavern biz? A: I graduated from Moore College of Art & Design and while I was there I waitressed at Cherry Street Tavern. They offered me some bartending shifts, which led to other roles. I left Cherry Street 11 years ago and opened Old Eagle. We acquired [Devil's Den] six years ago. Q: Last year, you got in the brewery biz. Why? A: I had two successful beer bars and we'd been looking around and I liked the General Lafayette Inn, which had a brewery but had been closed for three years. It went back on the market in 2013 and it seemed like a good fit. We own beer bars, why not a brewery, too? Q: How much did you invest to acquire the property? A: We used some money from Old Eagle and Devil's Den, personal savings and loans. The brewery needed work. We put in about $1.5 million for everything. Q: There aren't many female brewery owners or brewers. A: Most are still male. You're starting to see a few more women. I don't brew yet, but I'm going to brew my first batch later this year. I've worked on recipes and suggested to our brewer what I think customers want. Q: What's special about your brews? A: Scott Morrison's our brewer. He's won multiple awards and he's known for Belgian and saison farmhouse ales. But his other beers are great, too. Q: How's the biz model work at Barren Hill? A: We self-distribute and right now we're selling to our own bars. We also sell to The Beeryard and supply friends having special events. A: Old Eagle patrons either have lived in Manayunk their entire lives, a lot of renters, and then there are people moving in for a first job or couples. Devil's Den has a different clientele, a lot of people still in school or [just] out of school and a lot of young families. At Barren Hill, it's a suburban, older crowd. Q: How big a biz is this? Revenues and employees? A: We have about 80 employees, about 30 full-time and most of them are management. We'll probably gross about $3.5 million this year. A: I want to focus on Barren Hill this next year, some new menu ideas and different events. We also want to do more self-distribution of our own beers to craft bars in the city. We have a seven-barrel system so we don't have the huge tanks they do at Yards [Brewing Co.] and that will limit how much we distribute.